The toughest watch of all time. This G-Shock red strap watch is designed for men into urban style and powerful functionality. This G-Shock features its trademark shock resistance, month, day and time funcaitaliy, and a stopwatch. 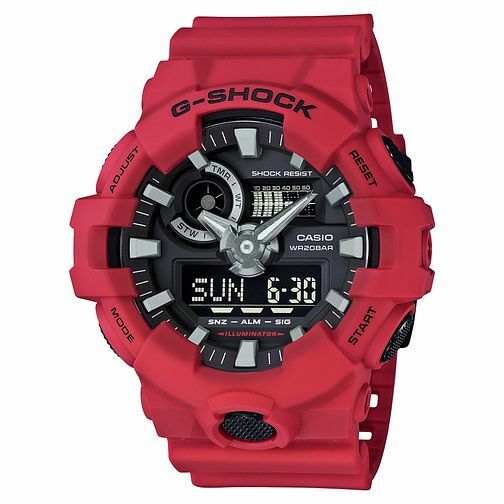 Casio G-Shock Men's Red Resin Watch is rated 4.3 out of 5 by 6. Rated 1 out of 5 by Anonymous from Another disappointing product from Samuels Watch delivered not working. Unable to then get it started. No instructions offered on how to make it work. No response from Samuels as to how to deal with this problem. Not coming back here.